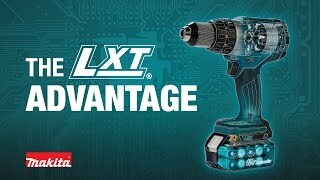 The Makita 18V LXT® Lithium-Ion Cordless Impact Driver (model XDT111) delivers power and speed in a compact size for a full range of driving and fastening tasks, with a fast-charging 18V Lithium-Ion battery for less downtime. The XDT111 features a Makita-built 4-pole motor with variable speed (0-2,900 RPM and 0-3,500 IPM) that delivers 1,460 in.lbs. of Max Torque. At only 5-3/8” long and 3.3 pounds (with battery), it has a compact and ergonomic design with less weight for reduced operator fatigue, and a rubberized soft grip for increased comfort on the job. The built-in L.E.D. light illuminates the job area for applications in dark spaces and close quarters. 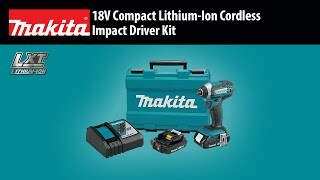 Makita’s entire line-up of impact drivers including the XDT111 is engineered with a proprietary hammer and anvil impact mechanism that is manufactured using the best raw materials with the highest quality steel, as well as a unique heat-hardening process for maximum fastening and driving power. With Extreme Protection Technology (XPT™), the XDT111 is engineered for improved water and dust resistance for operation in harsh job site conditions. Makita's proprietary hammer and anvil impact mechanism is manufactured using the best raw materials with the highest quality steel and unique heat hardening process for maximum fastening and driving power. Net Weight (with battery) : 3.3 lbs. Shipping Weight : 10.3 lbs.